Toggenburg Bergbahnen AG: "We focus on the qualities of the region"
Ms. Eppenberger, you know all about the Toggenburg Bergbahnen from the CEO perspective, having held the role temporarily a couple of years ago for a period of 18 months. Why didn’t you want to stay CEO? Mélanie Eppenberger: It was always going to be just temporary so we had time to look for a suitable candidate for this crucial post without rushing into things. I was able to amass valuable experience in this time. Yet, my passion doesn’t really lie in the operational side of things. I like to plan and develop concepts, and I really enjoy working out the long-term strategies and visions for our company. That’s why being the Chairman of the Board of Directors is definitely right for me. How do you lead a mountain tourism company successfully into the future? Mélanie Eppenberger, Chair of the Board of Directors of Toggenburg Bergbahnen, on the Chäserrugg mountain-top restaurant designed by Herzog & de Meuron, and her expectations of Credit Suisse as a financial partner. This also includes more substantial investments such as the new summit building by star architects Herzog & de Meuron, which floats on the Chäserrugg mountain like a giant wooden barn. What is the message behind this construction? The building is very much in keeping with its surroundings: lots of light and space, yet full of sheltered alcoves. With the simple, natural-finish woodwork, we are deliberately imitating the style of traditional farmhouses and barns in the Toggenburg region. In comparison to other winter sports resorts, the wonderful Toggenburg landscape has remained largely untouched up until now and thrives on the firmly rooted people who live here and their traditions. We focus on the qualities of the region to provide a type of tourism that is in harmony with local culture and nature. People that come to us can expect a peaceful and relaxing experience. The architecture of the summit building encompasses all these messages. The cable car docks directly at the new summit restaurant designed by Herzog & de Meuron at the top of the Chäserrugg mountain. What additional strategic considerations are behind the most recent changes? 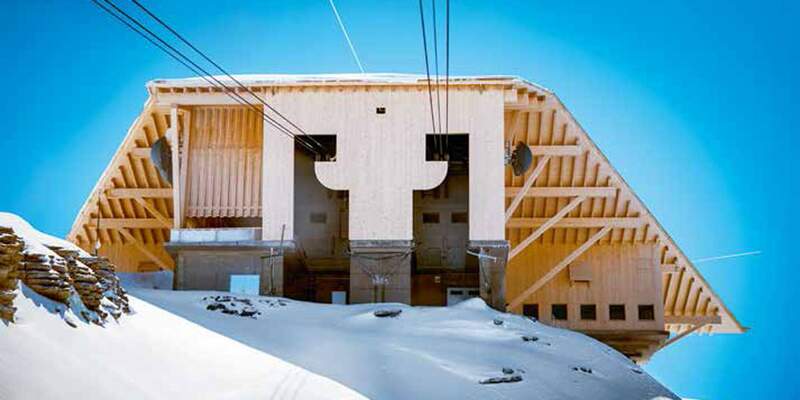 In addition to the summit building, Herzog & de Meuron have also built three stations for the new cable car. This has created a second access route to Chäserrugg. We invest primarily in projects that counteract the weather dependency of our business and that improve the quality of the experience in the region. Is it really possible to make long-term commercial plans for a mountain cableway? The issue of weather dependency is actually our greatest challenge. The question here really is how to increase utilization during the week and on days with poor weather. One option is to promote reservation-based group business. How do you handle the stagnating skiing market? A key part of our strategy is based on the Chäserrugg mountain itself, which has an extraordinary topography: a summit with a flat apex. It is one of a kind in the Alps region and the only mountain in the imposing Churfirsten range that is accessible to visitors. The Chäserrugg is consequently a hit with both skiers and trekkers. Through our investments, we hope to offer a new kind of skiing: less speed and frequency, but a greater experience of nature, enjoyment, and rest and recuperation. Furthermore, our projects are aimed not only at the winter season, but also focus increasingly on promoting summer operations. You could say that we are diversifying the types of sports on offer, in order to avoid a concentration of risk. What attracts you to this rather risky sector? From a business perspective, it fascinates me to take visions and make them economically successful in reality. I find it extremely gratifying to put a team together and experience the moment when people suddenly understand the vision and come on board. Sector-specific factors are certainly an added challenge. It is a task that requires patience, powers of persuasion, and assertiveness. Sounds like nerves of steel. Do you need them? It's advisable to stay away from this sector if you’re going to lose courage or even sleep because a season goes badly. Maintaining composure and not losing sight of long-term goals are central to my job. And I can be very tenacious (laughs). Once a decision is made, I see it through. There were other banks in the running for the financing of the summit building and the Stöfeli cable car. Why did you decide on Credit Suisse? Right from the beginning, it was an eye-level partnership with a reciprocal degree of professionalism. We put forward a detailed, 400-page business plan, from which the Credit Suisse relationship managers came to all the right conclusions. Credit Suisse is also able to provide us with everything from a single source. We have access to the specialists in the corresponding areas, be it for payment transactions, financing, or equities. Credit Suisse was the most successful bank at identifying our needs and won us over by coming up with an attractive overall financing plan within a very short frame of time. What requirements are we talking about specifically? They include an in-depth knowledge of the industry encompassing the sector-specific risk factors: winter, weather, and currency. Mountain cableways require large-scale investments that have a long economic life, and they have a specific set of financial ratios due to the seasonal and weather-dependent fluctuations. These ratios include a sector-specific debt-to-equity ratio. There needs to be an understanding of this and it must be incorporated into the analysis. Because the Credit Suisse relationship managers understood the business so well, they were able to provide us with some very exciting solutions. Solutions that surprised us somewhat, like the leasing proposal for the mountain cableway. What are the benefits to you of leasing? Leasing provides us with 100-percent financing over a very long period. It's ideal for a large-scale investment such as a mountain cableway. In contrast to third-party financing, with leasing neither the investors nor the conditions or interest rates change. This provides security and stability. Were there other sector-specific challenges that required a creative solution? The financial requirements of a mountain cableway are not the same in winter as they are in summer and can also vary from month to month within the same season. Credit Suisse's versatility was also evident in terms of financing current assets. This flexible approach allows us to effectively offset seasonal fluctuations in turnover that are inherent in our industry. How important is a long-term partnership with the bank for your company? A long-term partnership is of paramount importance, given the seasonal nature of our business. The long-term approach is most evident when it comes to the leasing contract. Large-scale investments like a new cableway require time to bear fruit in economic terms. Furthermore, we may have to contend with unexpected delays, such as waiting for planning permission. It is here that we need a partner like Credit Suisse, who sits in the same boat with us and rows in the same direction. Toggenburg Bergbahnen AG came into being following the amalgamation of various mountain cableways that have been facilitating tourist access to the Chäserrugg region since 1972. With some 70 employees, largely from the region itself, it also operates restaurants and a ski school alongside the cableways. The company now brings in 30 percent of its annual turnover in the summer. The summit restaurant designed by Herzog & de Meuron on the Chäserrugg at a height of 2,265 meters above sea level was opened in 2015, and the new 10-person Stöfeli cable car with three further mountain stations by Herzog & de Meuron began operating in 2016. Renovation of the valley station in Unterwasser is planned.